OLD SAN JUAN, Puerto Rico — On a recent afternoon on Fortaleza Street, Peter Schintler and his staff were working to remodel Marmalade, a restaurant where Schintler is chef and owner. It suffered severe flooding and developed mold in the days after Hurricane Maria, a disaster unlike anything he had experienced in the 13 years since he opened the restaurant. Schintler’s menu, which is mostly vegetarian, was impacted too. He depends on produce from local sustainable farmers, and an estimated 80 percent of the island’s agriculture was destroyed. Wearing his white chef’s jacket, Schintler said he puts on his uniform every day to achieve a sense of normalcy until his restaurant can reopen, hopefully within two weeks. “It makes you feel like you’re a day closer,” he said. Down the street, Michael Walstrom, the owner of Punto de Vista Restaurant, a rooftop bar and restaurant, had been working to get a generator installed. He said one of the most challenging aspects of operating a business in Puerto Rico now is not knowing what the future will hold. “The economy is changing, and we’re entering into the unknown,” he said. Walstrom's comments reflected the worries of many shopkeepers throughout San Juan who are struggling to stay open in the aftermath of the hurricane, which tore through Puerto Rico on Sept. 20. Much of the island including parts of San Juan are without electricity or have it intermittently. Many municipalities still lack running water. As of Monday, the government said it had restored 18 percent of the island's electricity, according to El Nuevo Día. The total contribution of Travel & Tourism (including wider effects on investments and supply chain) contributed more than $8 million, about 8 percent, to Puerto Rico’s GDP in 2016, according to a report by the World Travel and Tourism Council. Those figures had been forecasted to rise 3.7 percent in 2017. A month after the hurricane, the cobblestone streets of San Juan’s historic district, typically bustling with tourists and locals alike, were mostly empty. Broken light poles hang precariously overhead. Many of the gem stone-colored historic buildings are still boarded up, and businesses remain shuttered. But there are signs — including a handful of noisy generators parked on sidewalks and a jeweler making transactions by flashlight — of the resiliency of local businesses determined to survive in a post-Maria world. 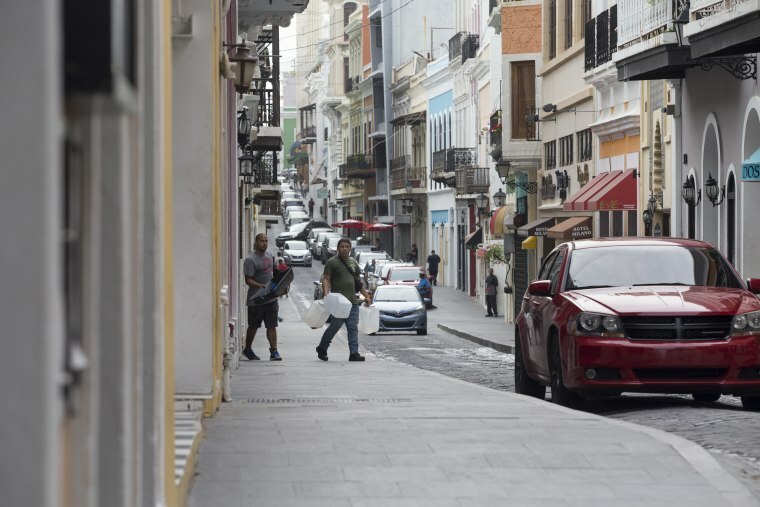 Some of the major cruise lines announced their return a couple of weeks ago to Old San Juan, which was welcome news to the vendors who have been trying to stay afloat amid few visitors. Idalys Torres, an employee of a local food stand, was busy cooking Puerto Rican codfish fritters known as bacalaítos and meat-filled plantain turnovers known as alcapurrias along Calle Comercio, a hot spot for street vendors selling local food to visitors debarking from cruise ships docked nearby. There were no cruise ships that day, and it had been slow following the hurricane. San Juan was a ghost town immediately after Hurricane Maria, said Elaine Shehab-Cortés, the owner of the Casa Cortés ChocoBar in San Francisco street. The chocolate-themed restaurant is owned by the Cortés family, an institution in Puerto Rico with a history of farming cacao and selling chocolate going back to 1929. Within a few days, the family had reopened the restaurant and was offering a limited menu to locals in need of food. They were also providing drinking water and meals to its employees and upstairs, at the Fundación Casa Cortés, the family was running Escuela Educa Cortés, a camp for children still out of school since María. Shehab-Cortes noted that a year ago, there would have been lines of people waiting to get into ChocoBar during the weekends. On Tanca Street, Nitza Zapata was sitting inside an unlit Casa de las Guayaberas, a shop that sells the iconic men's linen shirt used by generations across the Caribbean and Latin America. She’s seen only a handful of customers since the storm hit. Back at Punto de Vista restaurant, Walstrom said businesses were changing their business models, with new menus, lower profit margins and re-created jobs for their employees. Bianca Fortis is a freelance writer based in Brooklyn and a member of the Transborder Media storytelling collective.